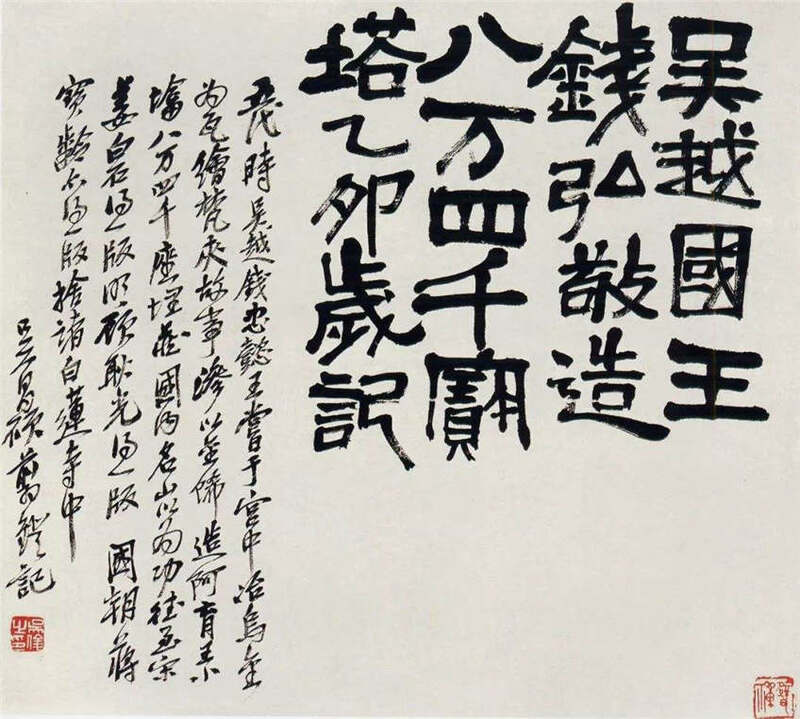 As an art for more than 3000 years, Chinese calligraphy is regarded as an illustrious tradition in Chinese culture. It is neither just writing Chinese characters nor writing well. It is actually an art to express spirits. A calligraphy work carries the calligrapher's personality, mood, idea, thoughts and soul. Chinese calligraphy, like the script itself, began with the hieroglyphs and has developed various styles and schools, after the long ages of evolution. Chinese scripts are generally divided into five categories: the seal character (zhuan), the official or clerical script (li), the regular script (kai), the running hand (xing) and the cursive hand (cao). Li shu / official character: a further simplification form of xiaozhuan. Kai shu / regular character: a standard writing today is square in form, non-cursive and architectural in style. Any calligrapher must start by learning to write a good hand in kaishu. Cao shu / cursive hand: used for making quick but rough copies. Xing shu / running hand: between the regular character and cursive hand. When written carefully with distinguishable strokes, it will be very close to the regular style; when written swiftly, it will approach the cursive hand. Chinese masters have always compared the three styles of writing (kaishu, xingshu and caoshu) to people standing, walking and running. Chinese calligraphy and Chinese painting are closely related because of lines. Both are base on lines to express the artist's concepts and feelings. Different ones for different purposes. They may be straight or curved, hard or soft, thick or thin, pale or dark. Chinese people have turned simple lines into a highly-developed form of art. Lines and strokes give Chinese calligraphy and Chinese painting unique qualities. The "Four Treasures of the Study" are a writing brush, an ink stick, paper, and an ink slab because they are indispensable to any traditional Chinese scholar. These four tools can help Chinese painter or calligrapher create the beauty of Chinese art. The brush may date back to at least three thousand years ago. It is made from fine, soft animal hair including three types: the white goat hair, black rabbit hair and yellow weasel hair. The brush handle can be made of bamboo, wood, lacquer, porcelain or some precious materials, mother-of-pearl inlay, ivory, and jade. Usually, painters and calligraphers have several types of brushes on hand to adapt to individual purposes and preferences. Initially, people often generally use nature ink or half-nature ink. In the Han Dynasty, the artificial ink appeared. It is made from a mixture of soot and resin and raw materials were pine, oil and lacquer. Ink sticks can be regarded as ink in solid state. Getting ink from the hard ink stick requires some physical labor, so ancient Chinese calligraphers had young boy attendants help them with this task. The procedure is like this: firstly, the ink stick is rubbed against the ink slab to generate ink powder; secondly, water is added to the ink powder to form the ink. One advantage of doing so is that you can easily adjust the density of the ink by changing the amount of water or ink powder. Paper is one of the most famous Chinese inventions and was invented by Cai Lun in the Eastern Han Dynasty. Then traditional bamboo slips and silk are replaced by the paper. The most famous paper used for Chinese calligraphy and Chinese painting is rice paper, also named as Xuan paper. Ink Slab is the container used in Chinese calligraphy and painting for grinding dry ink (ink stick) and mixing it with water. Most of ink slabs are made of stone, but other materials, such as, pottery, brick and tile. The stone must be relatively fine whetstone in order to protect the bristles of the brush and to facilitate the grinding of the ink stick. Thus ink and the ink slab acts as an inkwell. In ancient times, artisans would have their names or other words engraved on their ink slab that would be passed on to future generations.